Origin and Habitat: San Benito and Guadalupe Islands, Baja California, Mexico. Altitude: Sea level to 300 metres above sea level. Habitat: Mammillaria neopalmeri is one of the more conspicuous plants on the San Benitos island, where over considerable areas, particularly on Middle Island, has established itself as the dominant plant. It covers Central Island like a blanket of grey cotton. Other endemic plants are Dudleya linearis and Hemizonia streetsii. 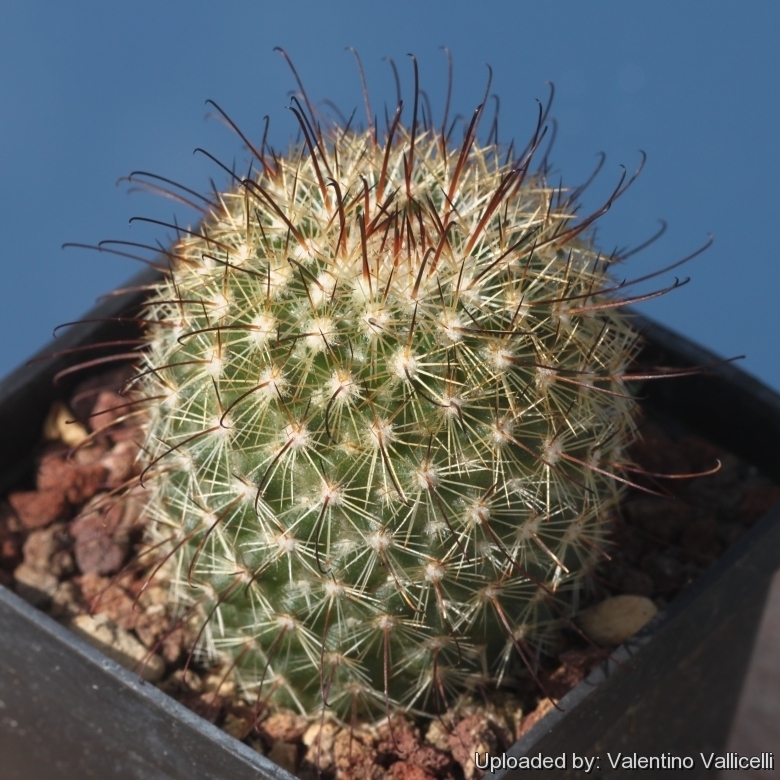 Description: Mammillaria neopalmeri is a low growing cactus species usually forming clusters or cushions. It is a gynodioecious species consisting both of hermaphroditic and gynoecious plants. Stem: Globose to somewhat elongated or shortly cylindrical, grey-green to glaucous, up to 9 cm tall and 5 cm across. Without latex. Tubercle: Conical, blunt pointed, four-sided basally, 4 mm high, latex free. Axil with abundant white wool and short twisted bristles. Parastichy number 8-13. Areoles: Wolly at the end of the tubercles. Radial spine: (15-)20-25(-30), slender, needle-like, white, 3-6 mm long. Central spine: (2-) 4 (-5), straight or occasionally hooked, brownish with darker ends, 6-8 mm long. Flower: Diurnal, actinomorphic, pale greenish white to light green, sometimes with pinkish tint, to 10-12 mm long and in diameter. Pistil in olive green, stigmas yellowish. Fruit: Club shaped, scarlet red , to 13 mm long. Remarks: The name “neopalmeri” (new palmeri) has been introduced to disambiguate a very tangled taxonomic question, because the name Mammillaria palmeri was previously published by Jacobi 1856, for another (not clearly identified plant) and necessitated the adoption of a new name to reclassify "Cactus palmeri" in the genus Mammillaria. 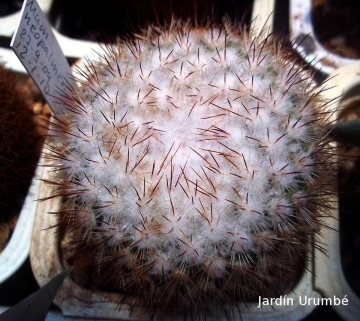 Cultivation and Propagation: Mammillaria neopalmeri is somewhat difficult to cultivate. During the summer it is best to keep the plants outside where the temperature can rise to over 30° C with no harm to the plant, recommended for any collection that needs lots of light with ample airflow. Growth rate: It is a small growing, but easily flowering species. It takes several years to offset, but once it starts it can form a large bunch in just a few years given the best conditions. Propagation: Direct sow after last frost or cutting. Seeds germinate in 7-14 days at 21-27° C in spring, remove the glass cover gradually as the plants develops and keep ventilated, no full sun for young plants! The seedlings should not be disturbed until they are well rooted, after which they can be planted separately in small pots. Cuttings: wait until the offsets that appear at the base of old clustered specimens are 1/3 the size of the parent and then detach and plant. Cuttings will take root in a minimum temperature of 20° C (but better in hot weather). Cuttings of healthy shoots can be taken in the spring and summer. Cut the stem with a sharp, sterile knife, leave the cutting in a warm, dry place for a week or weeks (depending on how thick the cutting is) until a callus forms over the wound. Once the callus forms, the cutting may be inserted in a container filled with firmed cactus potting mix topped with a surface layer of coarse grit. They should be placed in the coarse grit only; this prevents the cut end from becoming too wet and allows the roots to penetrate the rich compost underneath. The cuttings should root in 2 to 6 weeks.